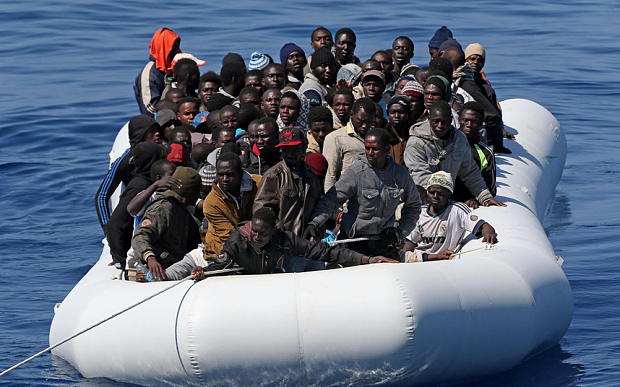 Switzerland - IOM has found that 76 percent of almost 1,400 migrants and refugees interviewed in Italy from 24th of June to 3rd August 2016 – and who travelled along the Central Mediterranean Route connecting North Africa to Europe – have responded positively to at least one indicator of the presence of human trafficking and other exploitative practices on the route. The anonymous surveys are designed to provide reliable data on the environments through which migrants and refugees make their journey, the hazards and risks that they face, and their often extreme vulnerability. The recent findings – which are the first from new efforts in Italy to monitor migration flows through North Africa – provide strong evidence of predatory behaviour by smugglers and traffickers and the kinds of enabling environments within which trafficking and associated forms of exploitation and abuse thrive. A significant proportion of migrant and refugee respondents reported direct experiences of abuse, exploitation, or practices which may amount to human trafficking. Such experiences range from not receiving agreed payment for work or services, to being kidnapped and tortured. In the majority of cases experiences were reported to have happened in Libya. If, while conducting the survey, interviewers come across people that may have protection needs, those people are immediately referred to specialized service providers and/or the police. While there have been many interviews, reports and qualitative studies that document the journey of migrants and refugees who take this route, the attempts to quantify the prevalence of exploitative practices that migrants are often subjected to has been limited. The findings from Italy follow an expansion of operations and ongoing data collection that started earlier this year along the Eastern Mediterranean Route. These most recent findings, however, show that rates of positive response to one of the indicators from migrants and refugees surveyed in Italy are up to seven times higher than the rates of positive response to the same survey conducted on the Eastern Mediterranean Route. Since June 2016, almost 1,400 respondents have been interviewed in Italy. Some 76 percent of respondents answered positively to at least one of the trafficking and other exploitative practices indicators based on their own direct experience during their journey, including: having worked or performed activities without getting the payment they expected; being forced to perform work or other activities against their will; being approached by someone offering employment; being approached by someone offering to arrange a marriage; and, being held at a location against their will by parties other than any relevant governmental authorities. Five percent of respondents also said that a member of their family travelling with them had experienced situations captured by one of the trafficking and exploitation indicators. Approximately 5 percent of respondents also reported that they knew of instances where people on the journey had been approached by someone offering cash in exchange for giving blood, organs or body parts. According to the majority, these instances took place in Libya and, to a lesser extent, in Egypt. Some migrants told interviewers that they had no choice but to give their blood, while being held captive. Indeed, 81 percent of those who witnessed these instances of coerced blood-giving, also reported of having been kept in a closed location against their will. “Two trends that we are extremely concerned about are the nearly 13,000 unaccompanied minors that have arrived in Italy this year and the 5,346 Nigerian women of which we estimate that 80 percent are trafficked,” said Federico Soda, Director of the IOM Coordination Office for the Mediterranean in Rome. “So far this year in Italy, IOM has already identified over 200 trafficked persons at the landing points, including underage girls, some as young as 13. We are also aware that the threats and violence perpetrated by traffickers against the families of the victims back in their country of origin is getting more and more devastating,” he added. “The increase in the number of unaccompanied minors is also extremely concerning. These minors are highly vulnerable and at risk of trafficking for sexual exploitation and labour. Often they are totally unaware of this reality. Protection systems throughout the migration process need to be strengthened in order to find solutions that are in the best interest of the child and that guarantee the rights that they have,” he noted. Respondents who answered positively to one of the indicators average 23 years old; a majority of all positive responses (52 percent) were given by migrants and refugees between 18 and 25 years old. The highest rates of positive responses came from Gambians (91 percent), Ghanaians (91 percent), Guineans (90 percent) and Ivorians (86 percent). IOM is committed to the principle that all migrants are entitled to the full realization of their rights. The Organization continues to call for improved capacity for identification, increased availability of specialized shelters, and better access to legal services for people who have been trafficked or otherwise exploited, as well as those who are particularly vulnerable to abuse, trafficking and other exploitative practices. IOM continues to provide protection-sensitive assistance for newly arrived migrants and refugees at points of disembarkation and of first reception in Italy, including legal counselling and other direct assistance activities. IOM also supports authorities in the identification of victims of trafficking, those in need of urgent assistance, and those most vulnerable to abuse, trafficking and other exploitative practices. The results of the survey are designed to further strengthen these activities. Within North Africa too, IOM has undertaken an array of initiatives to combat human trafficking, working with migrants, governments, NGO partners, civil society and host communities alike. In Libya, direct assistance is provided to migrants rescued at sea, stranded migrants, and migrants in detention, including immediate relief such as consumables and a change of clothes, as well as more extensive medical and psycho-social care. IOM continues to work with the Libyan Coast Guard on the identification of victims of trafficking so that appropriate protection measures can be extended to migrants who have been trafficked. Victims of trafficking in Libya are at particular risk as not only have they experienced trafficking and exploitation, but then they find themselves in a country that has been wracked by instability for the past five years. IOM has put together a guidance document for governments and humanitarian practitioners on how to work with victims of trafficking specifically in a crisis setting. IOM has undertaken information campaigns in Libya, Tunisia, Egypt, and Italy to ensure that migrants and citizens at risk of pursuing irregular migration are made aware of the hazards, such as human trafficking, including in particular along the Central Mediterranean Route. The survey has been conducted with the support of IOM’s Migrant Assistance Department. IOM's DTM migration flow monitoring operations in Europe have been funded by ECHO (European Commission's Humanitarian Aid and Civil Protection department), SDC (Swiss Agency for Development and Cooperation) and DFID (United Kingdom Department for International Development). Further data from IOM’s migration flow monitoring operations can be found here.